Carefully Crafted Album Design integrated with the Best Album Proofing on the Planet! No more sending PDFs and taking phone calls or trying to use software not built for album presentations. AE makes it easy to show album designs to your clients and gives lots of options for a great viewing experience. Just the right opportunity for your client to provide their feedback while getting your album design done right the first time. All comments are automatically saved, giving you a revision history to protect against miscommunications. Upload your logo plus change the color scheme—you can even customize the web address so everything relates to your brand. If you're looking for a quality design service and want the workflow benefit of staying in one place for your album process - we’ve got you covered! Modern and elegant designs that will beautifully display your images and tell the story of the event. The pricing is simple and always straight forward while being incredibly easy to order. Beautiful high-end albums and a seamless workflow – now, you can have it all in one place! We've carefully developed our premium flush mount albums with input from some of the most talented album makers in the world and integrated these stunning books into our proofing software for one very easy album process. Wow your clients with these elegant and timeless books, while making the process fun and profitable for your studio. Save even more time and make sure everything's correct with our Send-to-Print feature. We'll verify the details and help streamline your album ordering. Share on Facebook or Twitter with one easy click. Embed a book view on your blog or website for clients to see albums and encourage album sales. A clean and easy way to proof designs with your professional clients while keeping organized in-house. No more sending PDFs and taking phone calls or trying to use software not built for album presentations. 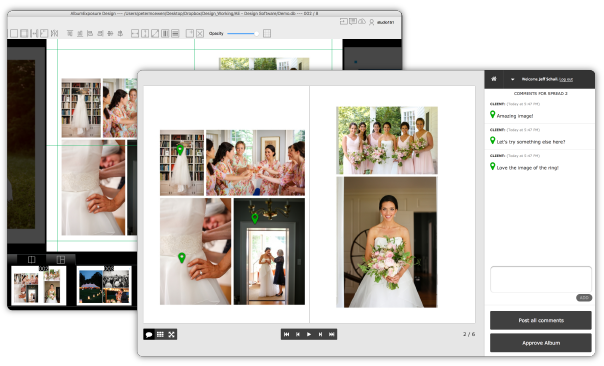 AE makes it easy to show album designs to your photographers and gives lots of options for a great viewing experience. Just the right opportunity for your photographer to provide their feedback while getting their album design done right the first time. All comments are automatically saved, giving you a revision history to protect against miscommunications. Upload & place your logo, plus change the color scheme to match your brand - so everything relates to your brand and creates a consistent experience for your clients. Proofing with photographers and their clients has always posed particular problems with communication and branding. We've solved that! Maintain multiple conversations between the appropriate parties and let your photographer direct their communication and branding as they need to. Win! Enterprise software can cost a fortune. There may be no limitations, but you end up paying for things you don't need or will never use, often wasting thousands to tens of thousands of dollars per year. Forget that...let's keep it scalable and sustainable, so we can grow together and make sure you only pay for things that bring you value.